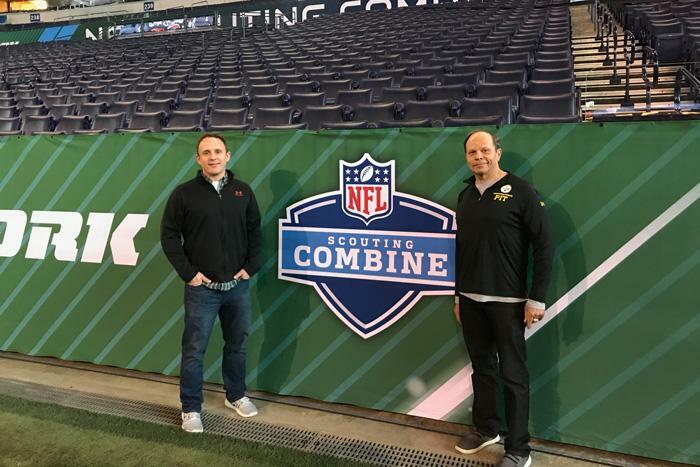 Steve Menzel '01 (left), a producer with NFL Films and the NFL Network, and Mark Gorscak '79 hit the field in Indianapolis for the 2018 NFL Scouting Combine. And if you’ve ever watched the event, you’ve probably seen Mark Gorscak ’79, a longtime Pittsburgh Steelers scout and the starter for the 40 for the past 15 years. A combine fixture, Gorscak will tell you that while speed counts, it’s not the only thing that sets the pros apart from the players who don’t make it. Gorscak has been around football a long time, even serving as a coach at Dickinson in the 1980s. And the Red Devils are still top of mind. A member of the Puggah group, he and several other alumni endowed the football locker room and compete in an annual golf tournament in memory of Gary “Pugs” Knechtel ’80 that benefits Dickinson athletics. But Gorscak didn’t become an NFL scout through love of football alone.